Realizing the fact that many of the developed countries are already drawing tangible benefits of geospatial technologies in a variety of discipline areas, while developing countries like Pakistan are merely a user of these technologies and its applications, a well-equipped Department of Remote Sensing and Geo-Information Science (RS&GISc) is established at Karachi to serve as a Centre of Excellence called National Centre for Remote Sensing and Geo-informatics (NCRG). The National Centre for Remote Sensing and Geo-informatics is mandated to fill in this technological awareness and skill development gap and to draw optimum benefits through these technologies in various national programmes. The Department runs under the Institute of Space Technology (IST), Islamabad. It has a mandate to offer a wide range of educational programs including short trainings and Master program in varied disciplines of Remote Sensing and GIS. The Master degree in RS&GISc is an intensive program for students who are interested in exploring the emerging space technologies and its applications in different disciplines. 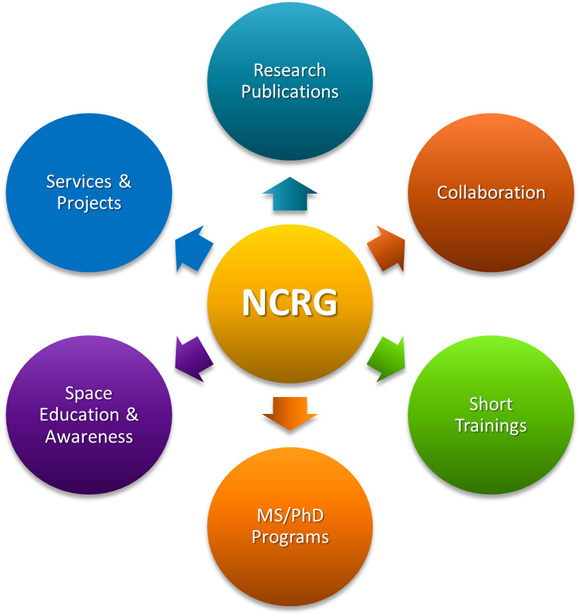 The Department of Remote Sensing and Geo-information Science (RS&GISc) provides a powerful platform for scholars, professionals, students, public and private sector organizations to broaden their vision in space-related technologies and applications.